MongoDB is a cross-platform document-oriented database and classified as a NoSQL database. Its not relational database. MongoDB works on concept of collection and document. Question: Is it similar to SQL/MySQL? No, Its totally different from Relational database. Question: In which language, MongoDB is written? Question: When First MongoDB was released? Question: When latest MongoDB was released? Question: What is latest version of MongoDB? Question: What is offical website of MongoDB? Question: Compare the Terminology of MongoDB and RDBMS? Question: Compare the Feature of MongoDb? 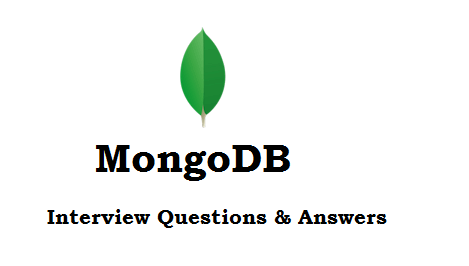 Question: What are main feature of MongoDB? It is database which provides a mechanism for storage and retrieval of data that is modeled in means other than the tabular relations used in relational databases like SQL, Oracle, etc. Question: What are different type of NoSQL? Question: What is Namespace in MongoDB? A Namespace is the concatenation of the "database name" and "collection name"
Question: Does MongoDB provide drivers for PHP? MongoDB provide the drivers for C, C++, C#, Java, Node.js, Perl, PHP, Python, Ruby, Scala, Go and Erlang. Question: What difference between MongoDB and SQL? MongoDB allows a highly flexible and scalable document structure. For e.g. one data document in MongoDB can have five columns & other one in the same collection can have ten columns. Also, MongoDB database are faster as compared to SQL databases due to efficient indexing and storage techniques. Question: Does MongoDB support foreign key relationships in MongoDB? But we achieve this concept by embedding one document inside another. Does MongoDB need lot of RAM? No, It need less than as compare to other database like SQL,MySQL. MongoDB dynamically allocates and de-allocates RAM based on the requirements of other processes. Question: What is the structure of ObjectID in MongoDB? Question: How many indexes does MongoDB create by default for a new collection? Question: Explain what are indexes in MongoDB? Indexes are special structures in MongoDB, which stores a small portion of the data set in an easy to traverse form. The procedure of storing data records across multiple machines is referred as Sharding. Question: How can you see the connection used by Mongos? Question: Explain what is a replica set? A replica set is a group of mongo instances that host the same data set. Question: Mention what is the command syntax for inserting a document? Question: Explain what is GridFS in MongoDB? For storing and retrieving large files such as images, video and audio GridFS is used. Question: What are alternatives to MongoDB?